Khadijah Ibrahiim is of Jamaican parentage, born in the city of Leeds, England. Educated at the University of Leeds; she has a MA in Theatre Studies. 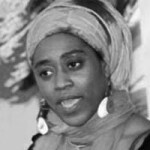 She is the Artistic Director of Leeds Young Authors and the Producer of Leeds Youth poetry Slam festival. Peepal Tree press published her poetry collection Rootz Runnin in 2008 that same year she toured the USA with the Fwords Creative Freedom writers. As a delegate for the Art Council England (Yorkshire) she attended Calabash international Literature Festival in Jamaica. Recently, she became one of the first international writers to attend the El Gouna Writers Residency in Egypt, 2010. She was a member the advisory group that organized some of the events, which marked the visit of Dr Nelson Mandela to the City of Leeds. Hailed as one of Yorkshire’s ‘most prolific’ poets by BBC Radio, she continues to make various stage appearances across Britain, the USA, the Caribbean and Africa. Peepal Tree Press will publish her latest collection of poems later this year. You can find out more about Khadija at Badilisha Poetry.